No fewer than five people must have recommended this book to me so of course I had to read it. If I’ve said it once, I’ve said it a hundred times; if I read a book in a day I either absolutely loved it or absolutely hated it. There is no middle ground on that one. I read this book in a day. I’ll give you a few seconds to guess what that means. I have a soft spot for fairy tales and their retellings. Some of them can be incredibly interesting and well done. Some of them, like this one, fail. Maybe I was looking for too much. 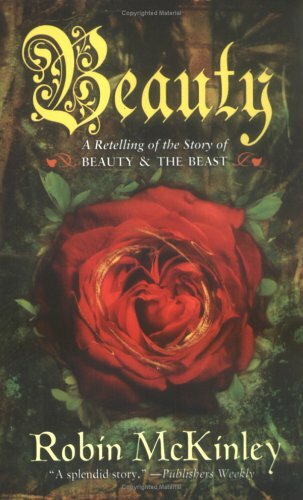 Maybe I assumed that by the title being Beauty: A retelling of the story of Beauty and the Beast I was assuming that meant McKinley would tell the old story in a different way. As it was, this book could have been called Beauty: The same exact story as the Disney movie only with some good (if incredibly long winded) descriptions and a magic system that makes absolutely no sense. I don’t think that would have fit on the cover, though. I guess I should give her some props for reinventing the tale. Beauty’s real name is Honour and she has two sisters (which isn’t in the Disney movie). They move from a port town where disaster wrecks the family financially to a northern town on the edge of the woods where her sister marries the blacksmith (also not in the movie). Oh, and Beauty in the book isn’t beautiful. She’s rather plain, as is told to the reader numerous times. Other than that, if you’ve seen the movie, you’ve read this book. I almost feel bad for giving this bad marks because McKinley really is a good writer, if long winded. For a short young adult book, Beauty takes about fifty or so pages to get started. During that first chunk it’s all endless descriptions, inane family histories, and the “ugly stepsister” description of how not beautiful Beauty is despite her ironic nickname of Beauty complete with how fantastic and lovely her sister’s are. Then, once the plot gets going, it’s the the movie all over again. Her father gets lost in the woods. Roses and a beast are involved. Beauty ends up living with this monster. The place is enchanted. Furniture moves on its own. Love takes root and the world becomes right again after a near fatal (and pathetic) account of the beast slouching in his chair (wherein Beauty thinks he is dying). Let me touch on the magic system, for a moment. Usually magic systems make sense. They have some background, some description. Something that makes them click in the world the author places them in. The magic system in Beauty was completely out of place. There is no magic in the world save for this enchanted castle and the beast who resides in it with his invisible servants that move tables and chairs. That’s fine, but it’s the library that kills me. This epic library has every book that has and will ever be published. Of course Beauty, who is a scholar among other virtues, falls in love with the place. I get having a big, fantastic library and I get loving a big, fantastic library but how on earth did it get every book that has ever, and will ever be published in it? Is it a portal into the future and past? It’s never described. It just exists. While it’s good to dream about, it’s completely out of place. It makes no sense to me. It’s almost so ridiculous it’s laughable. It’s romantic, I could easily love a library like that but that doesn’t make it part of the world. The romance of an idea doesn’t make the idea make sense. Furthermore, the enchantment on the castle is rather ridiculous as well. While witches and things of that nature are mentioned in passing, there really is no magic except for this enchantment. How, then, did an enchantment that strong take hold in a world with virtually no magic? Perhaps I am over thinking this, but in a book I think something like this should at least have an attempted explanation. If you are an author prone to incredibly long (well written) and redundant descriptions which slow the plot to almost a snail’s pace, you should at least attempt to direct one of those explanations toward setting a foundation to a world with plausible magic in it. Saying “and in the north there was rumored to be witches” or something like that doesn’t cut it. A lot of people could say the same thing about me, but that doesn’t mean I’m magical nor does it make the possibility that I can do magic any more plausible than saying “and Sarah looked like a wedge of cheese” makes me look anything like a wedge of cheese. What disturbs and frustrates me about this book is that the idea could have resulted in such an incredible story. The writing is wonderful and if McKinley had cut her incredibly long and painfully dull start to the book (with intermittent parts like that throughout) and added some action, some good world building and some unique qualities, Beauty would have been a runaway hit. As it was, her obvious flair for writing was diminished by a magic system that made no sense, descriptions which were incredibly long and serve as huge speed bumps to a plot that has almost no unique qualities. This is a “retelling” in the most clear sense. It’s retelling a tale that everyone already knows, almost by rote. Yes, I realize this is a book written for younger readers, but using that as an excuse for many of these qualities I’ve listed is a cop out. Plenty of books written for younger readers contain many, if not all of the aspects this one lacked. If you want to read a book that you don’t have to think about, or if you are in the mood to read a book that will give you a fuzzy feeling in your bosom, this is for you. However, if you are like me and require something besides good writing for a book to be a hit, I’d recommend staying clear of this. A solid magic system is a must for any fantasy book for me. Without it, the book soon starts to unravel. I completely understand your frustration. At least in the Disney movie the magic can be explained by "It's the Disney-verse, magic is damn near everywhere!" too bad, as it sounds like it had a rather interesting and non-disney-ish opening. other sisters, port city, excitement, etc. I wonder if maybe McKinley was aiming more for teen girls/chick lit audience? people who are looking for "disney plus a little", and don't care if the magic isn't explained? Jamie – too true, that is exactly how magic in the Disney-verse is explained! and you can sing it into and out of existence! This book was published in 1993, I read it probably for the first time and several times since. I like it, it is an easy read. I don't go into too much depth in analyzing what I am reading otherwise I probably wouldn't enjoy anything that's out there. As beautiful and rich of a fantasy as only Robin McKinley could write! Stumbled on your blog and you should know that actually, this book was originally published in 1978. Disney ripped off McKinley, not the other way around!